Sanofi-Aventis took on Dabur Pharma in the latest pharmaceutical patent case law to be decided at the Malaysian High Court (D-22IP-46-2009). Sanofi is the owner of a process patent – MY ’481 – for the production of Docetaxel trihydrate, which they market as Taxotere. Worldwide annual sales of Taxotere totaled approximately US$3.1 billion dollars in 2010. Dabur manufacture Docetaxel Trihydrate in India, which it began importing into Malaysia in 2005, and selling under the trade name Daxotel. In 2006, Sanofi won an interlocutory injunction to prevent Dabur from selling Daxotel in Malaysia. In 2009, Sanofi sued Dabur for infringing Sanofi’s MY ‘481 patent by importing the generic Daxotel. In seven days of hearings, and after listening to no less than nine expert witnesses, the Malaysian High Court judge effectively concluded that Dabur had successfully managed to ‘invent around’ Sanofi’s MY ‘481 patent. Even though the end product was identical,i.e. Docetaxel Trihydrate, the process Dabur used was different to the process claimed in Sanofi’s MY ‘481. Therefore, Dabur was cleared of all infringement allegations and is now clear to sell Daxotel. The judgement was very interesting on many levels. The judge commented that she believed Sanofi’s expert witness scientist was not a true person skilled in the art. Sanofi went for one Yuen Kay Hay – a local ‘pharmaceutical technology’ professor at the University Sains Malaysia. However, apparently even during the trial, Sanofi admitted that the true person skilled in the art should be an organic chemist. In contrast, Dabur’s expert witness scientist was an American organic chemistry professor from the University of Texas names David Burgess. The judge went so far as to state in her judgement that on issues where the two expert scientists were in conflict, she found Dabur’s expert more convincing than Sanofi’s. She indicated that the true person skilled in the art in relation to the synthetic pharmaceutical drug process covered in MY ‘481 should really be an organic chemist. Next, the judge reasoned that since the infringing Dabur Daxotel was identical to the Taxotere produced via Sanofi’s MY ‘481 patent, the burden of proof fell on Dabur to show that their process of manufacturing Daxotel was not infringing. Malaysia’s patent law statues are largely in line with the TRIPS agreement. Article 34 of TRIPS provides an avenue for the reversal of burden of proof for process patents from plaintiff to defendant. The science in this case revolved around the conversion of Docetaxel to Docetaxel trihydrate. Both the synthesis of Docetaxel and its anti-cancer properties were known before the priority date of Sanofi’s MY ‘481. The key differences between Sanofi’s MY ‘481 and the Dabur process are illustrated below. Claim 1 in Sanofi’s MY ‘481 covered Docetaxel + an alcohol + H2O as the reactants. Dabur’s process used acetonitrile instead of ethanol, which does not contain the–OH alcohol chemical group. 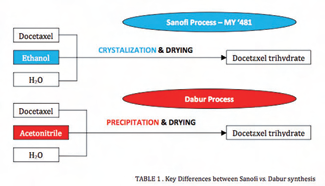 Moreover, Dabur argued that their process involved “precipitation & drying,” whereas Sanofi’s MY ‘481 involved “crystallization & drying”. Q1. Does the variant have a material effect upon the way the invention works? (i)Acetonitrile dissolves Docetaxel differently vs. ethanol e.g. acetonitrile only interacts with the acidic hydrogen atoms of Docetaxel, whereas ethanol interacts with both the acidic hydrogen atoms and the oxygen atoms of Docetaxel. Q2. Was it obvious that the variant performs the same way? At the priority date, no skilled person knew how acetonitrile would react with Docetaxel. Therefore, it could not have been obvious that acetonitrile performs in the same way as ethanol. Q3. Would a skilled person conclude that Sanofi intended strict compliance with the wordings of the claims in MY‘481? Claim 1 in Sanofi’s MY ‘481 covered Docetaxel + an alcohol containing 1-3 Carbon atoms + H2O as the reactants. Sanofi cannot extend “an alcohol containing 1-3 Carbon atoms” to cover acetonitrile, which likes –OH alcohol chemical group. As a result, the judge determined that Dabur’s process did not fall within the scope of Sanofi’s MY ‘481. Sanofi’s infringement claims were dismissed with costs. To rub salt in Sanofi wounds, the judge concluded that damages would be awarded to Dabur for the period that Sanofi prevented Dabur from selling Daxotel via the 2006 court injunction.